This creamy vegan ranch recipe is perfect for dipping, dunking, drizzling, you name it. It’s dairy-free, paleo friendly, and tastes just like the real thing (or better)! Best of all it’s ready in under 5 minutes! The base for this delicious vegan ranch dressing is my creamy cashew mayo, but any vegan mayonnaise will work. For how tasty and versatile ranch dressing is, it’s actually ridiculously easy to make. Are you ready? Congratulations, you’ve just made America’s most popular dressing! Don’t let the simplicity fool you though, ranch dressing has big flavor. There’s a reason it’s so popular after all. It’s absolutely delicious on salads, carrots, pizza, buffalo wings, french fries, I even know a girl who dips their pretzels in it (yes that girl is me, don’t judge me until you’ve tried it). These rainbow summer rolls are also ridiculously good dipped in ranch. This vegan ranch dressing recipe comes out thinner than what you’d get from store-bought ranch which makes it perfect for drizzling over salads. If you use your ranch for dipping or just prefer a thicker consistency, let the dressing sit in the fridge for 30-60 minutes. This will let it thicken into that creamy ranch we all know and love! If you’re looking for a healthy appetizer to bring to that summer cookout or BBQ then look no further. 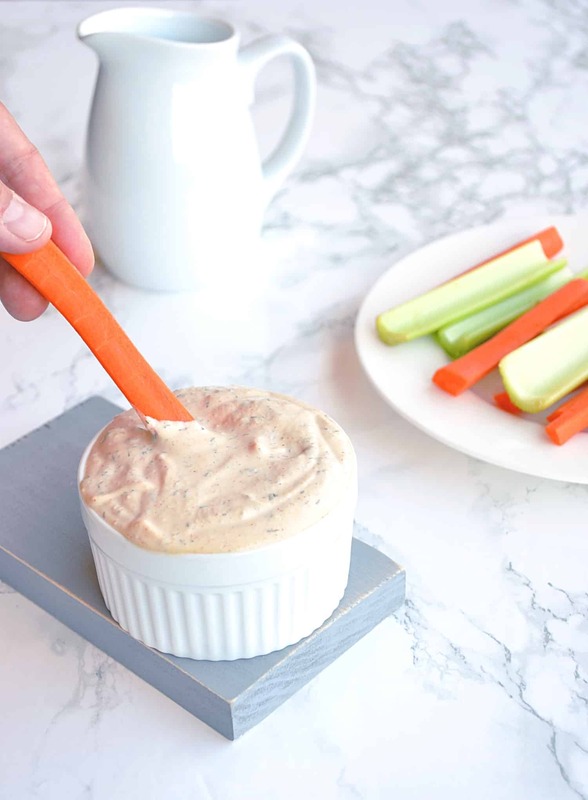 Simply whisk together some ranch and bring some carrots, celery, tomatoes, or even broccoli for dipping. You’ll have a healthy snack that everyone will love with only a few minutes of prep time! You can also try out this vegan 15-minute pasta salad if you’re in need of another easy + delicious appetizer. A creamy and delicious vegan ranch dressing that tastes like the real thing! Super easy and ready in under 5 minutes. Dairy free + paleo friendly. Perfect for dipping or drizzling on salads. I want to try the pasta salad next! Thank you Jean, I’m glad you enjoyed it!